Buy an Ontario business name search from Business Registration and we will send you the first 200 Ontario business names and trademarks having a given keyword or two. So this is a two-in-one search. You get business names, including corporate names, and trademarks for your keyword. 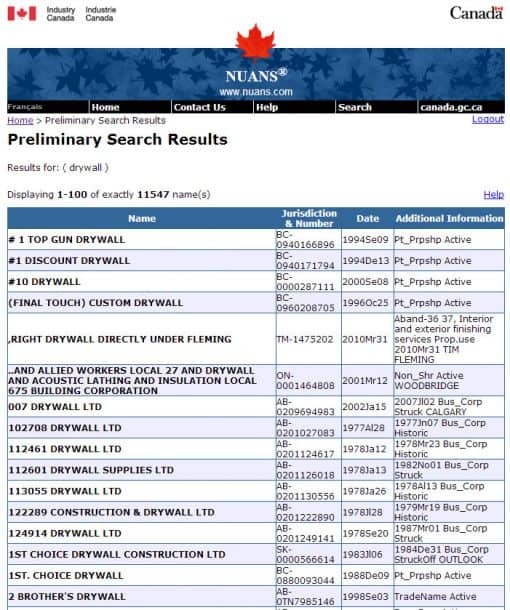 We use the NUANS pre-search database to search business names and trademarks. Some keywords are so common that there will be far too many results to send you, so we limit nuans pre-search results to the first 200 trade names and trademarks. For example, a nuans pre-search for the word “drywall” results in 11,547 trade names and trademarks. It takes 116 pages of 100 trade names and trademarks per page to save and send the complete result, which if printed, would result in about 600 printed pages and a huge waste of time. When searching common words, please add an additional word to narrow the results. 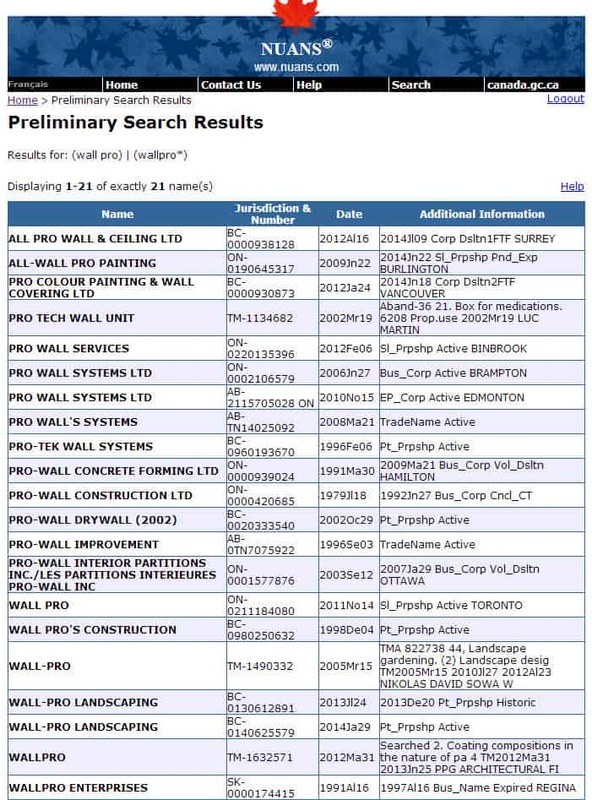 For example, a nuans pre-search for the words “wall pro” results in a manageable list of 21 trade names and trademarks. 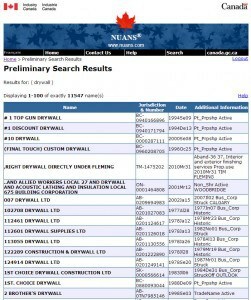 In this example, we show the results of a two keyword nuans pre-search. We used a boolean operator “|” to find names that would be either the conjoined word WallPro or a combination of the two words Wall and Pro. We also added an “*” to wallpro, to capture names such as wallpros and wallprofessionals. Do I Need an Ontario Business Name Search for Registering a Sole-proprietorship or Partnership? 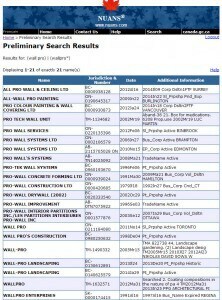 Yes, an Ontario Business Name Search will show you whether your business name or trade name is available. People often register a business name that is same as or deceptively similar to another business name. Business names include both trade names and corporate names. When you get a cease and desist letter a year later, you would probably become agitated and be in denial that you did anything wrong. It is better to learn that there is a problem before you hand out 100s of business cards and build a nice website over your chosen name.